Genre: Fantasy All Jamie Pel wants is a quiet life in his demesne and someone to share it with. As the secondary heir—the spare—of the Magne of Pel, his uncle, he’s avoided the pomp and ritual other Magnes and their primary heirs seem to relish. But with talk of a nascent slave trade circulating in Gallia, the Magne of Pel recruits Jamie to join an observation mission to the Scour, the blasted, burned-out territory where people sell themselves into slavery to get out. With nothing but good intentions and a desire to steer clear of drama, Jamie obliges, but while he’s out-demesne, his uncle and beloved cousin—the primary heir—are both killed, elevating Jamie to a powerful position he’s spent his life trying to avoid. Returning home, he discovers traitors and thieves under his own roof and a tinderbox of ambition and intrigue about to explode among his fellow Magnes. With Magic afoot and a vicious power struggle stretching to every corner of Gallia, Jamie doesn’t know who to trust or where to turn. But if he doesn’t rise to the occasion—and soon—all of Gallia could be absorbed by the blighted Scour, and everything—and everyone—Jamie loves could be destroyed. Most of you know that I take on editing and proofreading jobs from time to time. I’m picky about those jobs because they take away from my writing time. 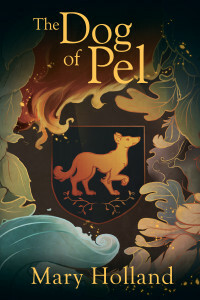 When Mary Holland asked if I’d be interested in proofreading her newest novel, The Dog of Pel, I didn’t hesitate to scream, “Yes!” Mary’s other works, The Bone Road and Matcher Rules, were high-quality literature, and I knew The Dog of Pel would be, too. I also know Mary through our joint work in Broad Universe, a non-profit organization that promotes the works of women writers in fantasy, science fiction, and horror. Her caustic, quick wit is delightful, and nobody ever accused Mary of not being the brightest tool in the shed. She’s well-read, and she shares her knowledge freely. She’s also a hard worker who believes in doing a job the right way, so I knew she was telling the truth when she said that she’d revised the novel until her eyes bled. Every proofreader wants to hear those words because it means our jobs will be that much easier. I took on the job, and it turned out to be as enjoyable as I expected. I love the characters in the story, and I love the smooth prose Mary whips out like she has a pen dripping with it. 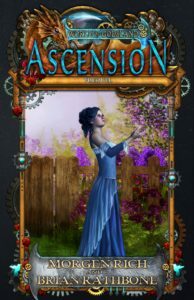 As a fantasy author, I appreciate her imaginative storytelling, and I thoroughly enjoy her style. I envy the cover, and I can say that the print version’s cover is even better than it appears digitally. The Dog of Pel is fun and suitable reading for Young Adults and Adults alike. I believe teenage boys will absolutely love it, and I hope it gets the notice it deserves from librarians. It would be a fantastic addition to a fantasy collection, particularly in a school library. I give you the initimable Mary Holland and The Dog of Pel! Why is your protagonist a white man? That’s the character I envisioned and while he is definitely male, I never mention the color of his skin. I do as little physical description as I can get away with because I believe readers visualize the protagonist in each story as a variant of themselves and a detailed description gets in their way. Also, character descriptions are boring to read. But a man? You’re a woman! Well spotted. I believe any competent writer can put themselves into pretty much any character, bisexual, transgender, man, woman, puppy, an alien with green tentacles, you name it. And I did have a beta reader, an actual man, check out Jamie’s reactions for credibility. He passed. Why don’t you write a series? Seriously, I have a lot of stories I want to tell, and I get frustrated if I stay in one world too long. The other new characters yammer for attention. I do have a beginning idea for a story set in the world of the Deom, which would be a sequel to The Bone Road, but I’m not working on it at the moment. Why does it take you so long to write a book? I start writing before I work out all the ramifications of the plot. Then I get stuck multiple times and have to rewrite older sections to fit. This can go on for months. I’m attempting to discipline myself; so far it’s not working. Also, I don’t write every day because life happens. What’s the hardest part of the story to write, the dialog, the exposition, the narrative? The damn descriptions. I hate writing “The green salon was hung with pictures of the hunt, the heads of dead animals, and brass hunting horns. Even the ink well on the writing desk was a horse’s hoof.” Those sentences took me three minutes to compose and bored me to death; also I stole the last bit from Virginia Woolf. On the other hand, I love dialogue; my characters can blither on forever. And I’m constantly writing more backstory and chopping it out. What comes first, the world, the character, or the plot? The character, every time. I visualize a character and build a backstory around her and then build her world and then, only then, do I start building the plot. Which obviously gets me in trouble is when I get impatient and start writing pre-plot. Thank you for granting me this interview, Mary! And thanks for sending The Dog of Pel out into the world. Mary Holland is the author of Matcher Rules, The Bone Road, and The Dog of Pel. After managing a corporate research library in Silicon Valley for twenty-five years, mostly to support her fantasy and science-fiction habit, she now writes full-time. She lives among the redwoods in California’s Santa Cruz Mountains with three cats and one husband. Find her online at www.mary-holland.com.